HomeHome, Garden & Tools55% Off CHOOCI – 4 Set Travel Packing Cubes – THE BEST Travel Organizers.Only $18.9! CHOOCI was founded by a lady, who travelled a looot during her career life. As most of you may suffer, packing the luggage efficiently is basically a skill which requires huge amount of experience. And, it is even harder to pass on to others due to different individual needs on various trip demands. However, there are some common needs in every trip, such as packing clothes, preparing an alternative pair of shoes, separating underwear from other dresses, stuffing toiletry and makeups into one bag, and mostly importantly for business person, organizing all your electronic gadgets and wires to make them easier to be found! Isn't that common for all? Isn't it amazing that CHOOCI is providing this solution with symbols on each packing cube to help you organize and manage your packing process more efficiently? Here we are, CHOOCI - the packing master, helping to organize your trip FROM NOW ON! 1. Categorize and Find your stuff in a second: CHOOCI packing cubes marks unique function of each bag in simple graphics. You don't even need an instruction and start to pack right away. 2. REALLY COMPATIBLE: CHOOCI packing cubes are not designed with fixed frames. It is so adjustable. If you only want to use 50% space of one bag, you can squeeze the room for other stuff. By testing, our packing cubes can save up to 30% space of your luggage! Amazing! So, aren't those all attracts you to start a new packing way, and just replace the okay-to-use packing cubes? Click "ADD TO CART" right now! Try it! 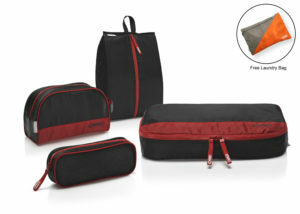 Specification: 55% Off CHOOCI – 4 Set Travel Packing Cubes – THE BEST Travel Organizers.Only $18.9!